Our popular series of T-Shirts featuring designs by some of today’s top underground artists continues. 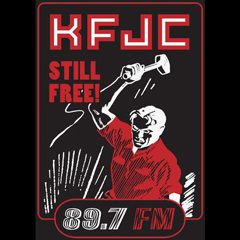 The struggle for Musical Freedom continues unabated at KFJC, and our new Artist Shirt proudly depicts that struggle via an extremely cost-effective slogan. This year’s Artist Shirt was forged in the hallowed cavern that serves as an unpleasantly damp studio for Art Crimes, one of KFJC’s air staff heard so infrequently on the air that it’s impossible to recall a single thing he may have uttered, other than “Call (650) 941-6800”. in sizes XS, S, M, L, XL and XXL as our thanks for your generous donation of $45 or more.